I'm taking a little break from the leftover turkey today, and the accompanying turkey sweats, to tuck into these Christmas Panna Cottas (Cottas? Cotties? What's the plural please?) 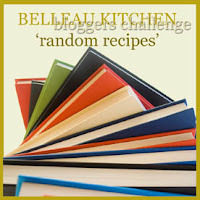 in aid of Belleau Kitchen's Random Recipe Challenge. This month Dom has surpassed himself with the most charitable, yet festive of themes. Summing up what Christmas is all about (kindness towards others, generosity and thoughtfulness as opposed to, say, turkey sweats) the theme is: Make Space for Some Christmas Charity. Dom has asked us to randomly select a recipe from a cookbook we never use which we are then donate to charity. As I love all my cookbooks, and treasure them as though they are my children (yep, all 35 of 'em), the giving-away-thing was going to be a bit tricky. However, following some negotiation with the lovely Dom it was agreed that I can still enter as I explained I'd just donated to the Guardian Christmas Appeal. And this recipe comes from a book I happily snapped up earlier this year from a charity shop. Brilliant. I thought about making this...as on their programme the Hairy Bikers said if you make one thing this Christmas, make this Panna cotta. Looks delicious... I might give it a go! They look absolutely gorgeous. I keep meaning to give panna cotta a go, wonder why I've never thought of doing them in silicon moulds - genius! Yum!!! I have this book also but I've never really paid attention to the pannacotta, quite remiss of me!! Looks so good. I still haven't tried pannacotta yet, I need to change that next year! Yours look very pretty and festive in their silicone moulds. They look so pretty Kate and just the right light dessert after all those mince pies! They are so pretty, I may try them in the new year, and use my starry moulds again!